The two definitions are equivalent if and only if partial v sub Y / partial X = 0 and so on. This means that v sub X, v sub Y and v sub Z are linearly independent. With this assumption your method is OK and can be used in the final paper. Wikipedia is often unreliable and / or incomplete. which is the same as I already found with my simplified terms for (v*del) v. Therefore the solution v_r is proportional to 1/sqrt(r) as described. I agree that this is not a Coulomb potential but a velocity potential so the results may be different. The result for v_r means that there is a flow from or toward the centre. So far all seems to be consistent. 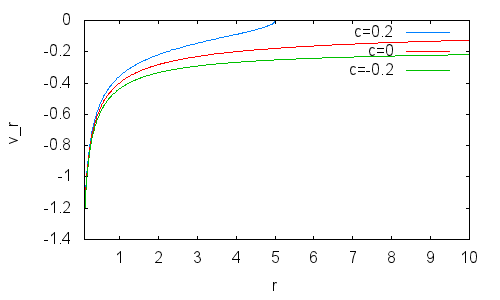 v_r is proportional to 1/sqrt(r) in the simplest case, depending on integration constant, see Figure. According to VAPS, the expressions grad and div are derived from the tangent vectors and surface flow in the corresponding coordinates. To be sure, we would have to analyze what the geometrical meaning of the operator (v*grad) is and derive this for the corresponding coordinate system. There the operator is denoted “material derivative” and is given. It is much more complicated than both above methods 1 and 2. I will try this operator and see what results. In order to solve this problem I think it is necessary to go back to the derivation of the (v dot del) v operator also given in VAPS The gradient, divergence and laplacian are also well known for general curvilinear coordinates. It is clear that the entire v dot del operator acts on v, so it seems to be a simple matter of working out v dot del. It is clear that Eqs. (9) – (11) of Note 356(4) follow from the usual divergence, Eqs. (6) to (8). So this looks like a problem in fundamental vector algebra. simply multiplied v and del in spherical coordinates and applied to v.
operator and see what results. UC Irvine is ranked 45 in the world by webometrics, 106 by Times, 58 by Shanghai and 153 by QS it has nearly 31,000 students and an acceptance rate of 40.7%, founded in 1965 on the Irvine Ranch near Los Angeles California. Staff and students have read www.aias.us frequently for nearly fourteen years. Its motto is “Fiat Lux”, “Let there be Light”. UFT88 is the famous paper by Horst Eckardt and myself which refutes the Einstein theory of genreal relativity by correcting its geometry to include torsion. In UFT99 and its simplified notes, it was shown that neglect of torsion means no curvature and the disappearence of gravitation, a disaster for the standard model of physics. These papers have been read many thousands of times without objection, so the avant garde intellectuals of physics have rejected the standard physics of gravitation completely. UFT109 introduced the Evans torsion identity, and it has just been translated into Spanish. This identity became part of the Jacobi Cartan Evans identity of UFT313 (the second Bianchi identity corrected for torsion). In UFT354, already showing signs of being another classic paper, metric compatibility was used to show that the Riemannian geometry used by Einstein is meaningless. When torsion is correctly considered, the relation between the metric and connection becomes exceedingly intricate, and the Riemannian torsion tensor must be totally antisymmetric. Usually, such obvious advances merit a Nobel Prize and Fields Medal. I am reliably informed that several Nobel Prize nominations have been made for my early work on B(3). It is known with certainty that several Wolf Prize nominations have been made. This is a crisis of such severity that physics is split completely into two: standard model and ECE / ECE2. The famous scientometrics show this beyond reasonable doubt. The award of major prizes ans honours is controlled by the standard physics. The avant garde school (AIAS / UPITEC and many others) adhere to the Baconian foundations of physics rather than chasing glitter. However, if prizes are to mean anything they must be awarded fairly. This is certainly not the case in physics or chemistry at present. There was the usual intense international interest, steady at a high plateau for almost fourteen years. The final feedback will be in as usual a couple of days from now. From the world’s top twenty universities there were visits from Michigan, Wisconsin Madison, Edinburgh*, Berkeley, Stanford, Cambridge*, and National University of Singapore. The equivalent of 137,532 printed pages was downloaded during the day (501.442 megabytes) from 2,926 memory files downloaded (hits) and 596 distinct visits each averaging 3.7 memory pages and 14 minutes, printed pages to hits ratio of 47.00 for the day, main spiders cnsat(China), google, MSN and yahoo. Collected ECE2 1967, Top ten items 1905, Collected Evans / Morris 957(est), Collected scientometrics 582(est), Fe(Sp) 550, Barddoniaeth / Collected Poetry 430, Evans Equations 361, Principles of ECE 323, Collected Eckardt / Lindstrom 294(est), Autobiography volumes one and two 280, Collected Proofs 265, UFT88 132, PECE 110, UFT311 104, CEFE 87, Self charging inverter 46, UFT321 44, Llais 36, Lindstrom Idaho lecture 29, List of prolific authors 26, Three world records by MWE 24, UFT313 40, UFT314 41, UFT315 46, UFT316 42, UFT317 33, UFT318 56, UFT319 58, UFT320 44, UFT322 60, UFT323 53, UFT324 70, UFT325 63, UFT326 44, UFT327 29, UFT328 44, UFT329 55, UFT330 40, UFT331 46, UFT332 44, UFT333 35, UFT334 39, UFT335 47, UFT336 39, UFT337 34, UFT338 34, UFT339 44, UFT340 39, UFT341 40, UFT342 30, UFT343 35, UFT344 47, UFT345 44, UFT346 52, UFT347 49, UFT348 64, UFT349 69, UFT351 65, UFT352 88, UFT353 72, UFT354 64, UFT355 29 to date in August 2016. City of Winnipeg UFT275, 316, 352; Iparadigms California UFT172, 177, Essay 32(Sp); Steinbuch Centre for Computing University of Karlsruhe Education Section, Proofs; Stanford University UFT238b-US; Physics City University Hong Kong Essay 24; United States Navy Space and Naval Warfare Systems Command “Evans Equations of Unified Field Theory” by Laurence Felker; Kaiser Family Foundation Menlo Park California general; Philippines National Electrification Administration general; Fitzwilliam College Cambridge UFT166; North-West University South Africa general. Intense interest all sectors, updated usage file attached for August 2016. In this method, Eq. (2) is used to calculate the aether velocity field directly from any material vector potential of ECE2 theory. Complicated solutions of differential equations are not needed in this method. Given the velocity field, the Kambe magnetic and electric fields of the aether are calculated from Eqs. (3) and (4). These induce material electric and magnetic fields through Eqs. (5) and (6). These are fields induced by spacetime, and are not present in standard electrodynamics. They are observed in the Osamu Ide circuit (UFT311 and UFT321) and self charging inverter paper on www.aias.us. So we start with the vector potentials present in the Osamu Ide circuit, and calculate the velocity field set up in the spacetime around the circuit, and finally the electric and magnetic fields induced in the circuit by spacetime. These are compared with experimental data. This set of three simultaneous non linear differential equations in three unknowns, v sub X, v sub Y and v sub Z, is also relevant for the aether flow induced by a gravitational field, another completely new concept of ECE2 unified field theory. I recall that back in the seventies the N. A. G. Library had Algol code for solving sets of equations, so by now plenty of code libraries should be available. The cloud based technology would bring in supercomputer ability, equivalent to an eighties IBM 3090 6S / LCAP system of the type developed at IBM Kingston and Cornell Theory Center. I have not been able to access supercomputers since the UNCC fiasco of 1995, but that cloud based ability will be very useful because it enhances a desktop into a supercomputer. I can think of code libraries such as NAG, IBM ESSL, Maple, Mathematica, and the new packages introduced by Doug Lindstrom and Russ Davis. Non linear physics introduces chaos physics as you know, and a very rich mathematical structure. I agree with Eq. (10) of the protocol, it would be interesting to graph this, if feasible, in spherical polar coordinates in three dimensional colour plots. In general the electric field strength E and the magnetic flux density B of any material will induce very interesting and entirely novel velocity flows in the spacetime or aether. This is your idea and it works fine. It is the direct logical result of ECE2 unified field theory as you know. The flows induced in the aether in this way will have a back effect on the circuit. For each type of boundary condition the induced aether flow will be different. The other type of theory uses the vorticity equation to produce aether turbulence, which may be transferred to a circuit as in UFT311 and in recent observations by Osamu Ide. There is already a great deal of international interest in this work as can be seen from the early morning reports. If more dependencies are allowed and all components are different from zero, there are more complicated equations as can be seen from vector equation o10 in the protocol. If all components of v have only an r dependence, the result is o12, not much simpler. Only with zero components v_theta and v_phi the equ. (2) of the note follows, see o15. There is an analytic solution o19/o20, but it is not a pure Coulomb potential, as already discussed with note 356(4). We have to interpret this result in any way, or the operator (v*grad) has to be calculated in any other way. However it seems not to be used in VAPS execpt for cartesian coordinates. Can this equation be solved with a partial differential equation package? It looks like an interesting non linear differential equation to which there may be an analytical solution. In order to eliminate the complexities of the spherical polar coordinate system I can set up the problem in the Cartesian system. In any case we have already proven the method of UFT356 and there is a great deal of interest in the latest UFT papers as you can see from this morning’s report. It would be interesting to model boundary conditions on an actual circuit such as that of UFT311, which is the ultimate aim of the research. I have noted down the result of the computer algebra and will use it in the paper, UFT356. It would be very interesting to graph it. Section 3 is pencilled in as usual for the graphics and computation. I can confirm that it is the radial component of Kambe’s vector potential, which is v, so it is not the Kambe scalar potential and not therefore expected to be a Coulomb scalar potential. As you know this is an entirely original result of fluid electrodynamics, and is not present at all in standard electrodynamics. As you suggested, E is inducing a hitherto unknown velocity field in the surrounding spacetime or aether. Such a concept does not exist in standard electrodynamics. with the original gradient operator of spherical coordinates. This then gives the result v_r ~ sqrt(1/r) for the potential. This has two terms of order r and 1/r. Unfortunately the integration constant %c is not in front of the r term so that this result is not the Coulomb potential. Details see in the attachment, see also the calculation for note 356(5). The expression for the divergence in spherical polar coordinates is the same from this Harvard site and VAPS, so that is a useful check. so Eqs. (1) to (8) of the note have been checked as correct. This means that Eqs. (9) to (15) of the note are correct. The protocol also seems to be correct. The diff. eqs. with full angular dependenced are o11-o13 in the protocol. For pure r dependence, the results are o15-o17. This gives constant solutions for v[theta] and v[phi]. These will only be different from zero if a constant background potential is considered, for example an overlay of constant aether flow. The solution for component v[r] is o20/o21. For %c=0, this is of type 1/sqrt(r), not of 1/r as expected. This needs to be clarified. In spherical polar coordinates this is found by solving Eqs. (13) to (15) simultaneously. In general, the velocity field has a very interesting structure in three dimensions. The simultaneous numerical solution of Eqs. (13) to (15) also gives the spacetime velocity field set up by a static gravitational field g (the acceleration due to gravity). This entirely original type of velocity field exists in a spacetime defined as a fluid. The spacetime can also be called an “aether”, or “vacuum”. Any boundary conditions can be used. A magnetic and gravitomagnetic field also set up aether velocity fields. OK many thanks again, I think that all is OK because the velocity is equivalent to a vector potential so we do not expect a Culomb potential. You are currently browsing the Dr. Myron Evans blog archives for August, 2016.